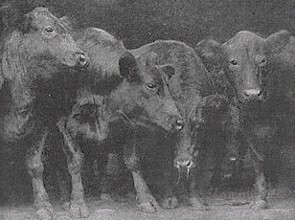 In 1904, there was still fear of Texas Fever carried by ticks on southern cattle. Therefore, cattle from southern states were not allowed to be exhibited in the breeding cattle shows held in September. Instead, separate shows were held for southern cattle from November 9 - 12. 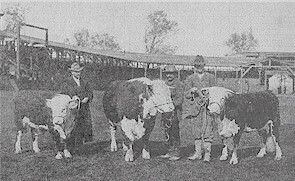 The show was called, "The Southern Breeding and Range Cattle Show." 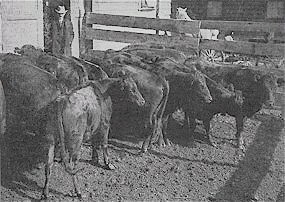 Over a thousand head of southern cattle were exhibited. The judges were Thomas Clark, IL; I. N. Forbes, IL; N. H. Gentry, MO; and W. R. Spann, TX. The conditions for judging were not the best for the range cattle show. It was a rainy, dreary time and some of the judging had to be done in the barns. Some complained that black cattle in the middle of an unlit barn could not be viewed very well. Breeding classes were judged individually in the Livestock Forum. The Shorthorns featured sixty head making up most of the pedigreed cattle exhibit. There were only two herds of Herefords represented and only one herd of Aberdeen Angus. One herd of Jerseys was entered but failed to appear. They were, however, replaced with another herd. Range cattle were judged in pens of 15 each. There were twenty-seven carloads of cattle brought in for the range cattle show. Fattened cattle from the eastern district made up five of the carloads. This exhibition was not popular due to the fact that the Kansas City Royal and the Chicago International were held during this time and they also featured a show of feeders and fed cattle. St. Louis did not have an established cattle market thus decreasing the numbers shown at the World’s Fair. The winning pen of fat cattle. The Fair offered a total of $13,570 in premiums for the cattle shown in this category. The show closed with a free Wild West Show on the afternoon of November 12. This "rodeo" was held in the Livestock Forum. Famous cowboys participated in, "Broncho busting, fancy-roping, cattle-tying, etc." References: Breeders Gazette, November, 1904. This page was designed Amanda Smith and Mike Friedrich and is maintained by Lyndon Irwin. Go back to the Beef Cattle page.